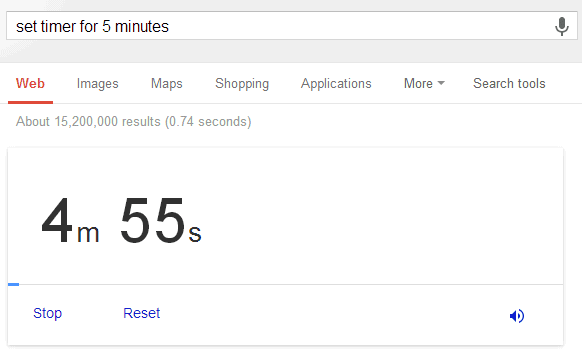 The desktop Google Search has a cool feature: search for [set timer for 5 minutes] and you'll see this interactive timer box. You can stop the timer, reset it and Google even has a notification sound you can disable. You can search for [set timer for 30 seconds], [set timer for 10 minutes and 10 seconds], [set timer for an hour and a half]. You can also use shorter queries: [timer for 30 seconds], [timer 30 seconds], [timer 30 sec], [timer 23 hours 59 min 59 sec]. 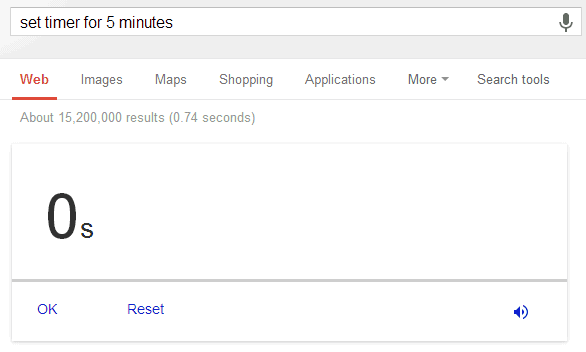 If you close the search page, Google shows a warning: "Leaving this page will stop your timer". You can also search for [timer 2pm], [timer 5:30], [timer 2pm tomorrow], [timer 2pm Thursday], but it doesn't work well everywhere. In Europe it uses GMT time, not the local time. Sometimes it works and sometimes it doesn't. Can't figure out why. Anyone has a tip? Thank you for the post. We always use google timer.